We’d love your help. 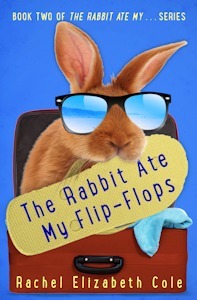 Let us know what’s wrong with this preview of The Rabbit Ate My Flip-Flops by Rachel Elizabeth Cole. You can’t bring a rabbit camping. That’s what eleven-year-old Drew Montgomery’s grandparents say when his annoying little sister wants to bring their pet rabbit, Tiny, along on the trip. And Drew agrees. It's bad enough that he will miss the release of the coolest video game of the year while he's stuck in a cramped travel trailer for a week with his grandparents and siste You can’t bring a rabbit camping. That’s what eleven-year-old Drew Montgomery’s grandparents say when his annoying little sister wants to bring their pet rabbit, Tiny, along on the trip. And Drew agrees. It's bad enough that he will miss the release of the coolest video game of the year while he's stuck in a cramped travel trailer for a week with his grandparents and sister. But Tiny is certain to cause trouble. Plus there are bears and eagles in the woods. And what if Tiny gets lost? To ask other readers questions about The Rabbit Ate My Flip-Flops, please sign up. In this follow-up to The Rabbit Ate My Homework, the adventures of Drew, Libby and Tiny continue, as they go camping with their grandparents. Though Drew initially isn't particularly kicked about spending a week in a trailer, once they get there, there are plenty of events and mishaps to keep them on their toes throughout. But that's not all. They also make new friends and even discover some people, who clearly aren't "friend" material! Once again, Rachel Elizabeth Cole packs quite a lot of action into a mere week, along with good humor, fun and bonding too. In The rabbit ate my homework, we met Drew and Libby, and knew how they ended having Tiny, a not so tiny overactive rabbit, as a pet. In this second book in the series Drew and Libby go to camp with Nana and Papa while their parents are out of town. This is not Drew's best plan for this week, since Galaxy Guilds, the best computer game of the year, is being released and he will have to wait till his back home to play it. Things get even more complicated when Libby hides Tiny in the trailer so he i In The rabbit ate my homework, we met Drew and Libby, and knew how they ended having Tiny, a not so tiny overactive rabbit, as a pet. Things get even more complicated when Libby hides Tiny in the trailer so he is not alone at home during a week. Everything will happen in one week! New friends, bullies, Tiny getting lost and then found, a not working trailer's toilet, a big bunnies' rescue, and even a new rabbit to bring home. The series are really entertaining, and always have a good message in them. The characters are adorable, and it's very easy to relate to them. Looking forward to the next book in the series to discover what the rabbit(s) are eating this time! Cute, fun, happy book that involves a rabbit, a very intelligent, convincing little sister and an easily blackmailed brother. In The Rabbit Ate My Homework, we meet Drew, Libby and their parents. This is the book that introduces us to Tiny, their rabbit, a Flemish Giant. In this second book in the series their adventures continue as quick and humorous as in the first. Drew and Libby's parents are heading off to Hawaii so their mom can attend a conference. They are going to spend the week camping with their grandparents, Nana and Papa. Drew is not crazy about theis idea as the new video game he has been waiting for is go In The Rabbit Ate My Homework, we meet Drew, Libby and their parents. This is the book that introduces us to Tiny, their rabbit, a Flemish Giant. In this second book in the series their adventures continue as quick and humorous as in the first. Drew and Libby's parents are heading off to Hawaii so their mom can attend a conference. They are going to spend the week camping with their grandparents, Nana and Papa. Drew is not crazy about theis idea as the new video game he has been waiting for is going to be released. Libby does not want tro leave Tiny at home alone, so she sneaks him into the camper to accompany them on their trip. gThe fun and laughs start right away when she keeps asking Papa to stop so she can use the bathroom. Once they realize that Tiny is aboard, it is too late to turn around so he is now/ part of the trip. Of course Nana and Papa do not want Tiny to run loose in the camper so they buy a cage, that Tiny hates. Lots of situations occur at the campground involving a dog, some mean boys, Nana and Papa's friends and Tiny's skills with opening cages. There are some more rabbits and some new friends. Despite the embarrassing situations, the messy ones and the wild chases, the camping trip is deemed a success by both Drew and Libby. Th only thing I did not like about this story was that Libby defies her parents by sneaking Tiny into the camper and then blackmails Drew into helping her "rescue" some rabbits that did not belong to them and even though there was a minor consequence, it may give children the wrong idea. Definitely a discussion about this if it is a read aloud would be beneficial. This is a great early chapter book for readers in late primary, early junior grades. It would be a good addition to classroom, school, family and public libraries. Drew has learned his lesson from book one, and now, is completely honest with his grandparents. When his little sister, Libby, secretly sneaks the rabbit Tiny along on their camping trip, he reveals all. But that doesn't keep the adventures away. Firstly, I loved that Drew was honest. So often, the plot starts with dishonesty, and it was fun to see that things can get out of hand even when one tries their best not to let them. The dynamic between Drew and his sister, their grandparents, and especially the grandparents with the rabbit was simply fun to follow. It's funny to watch them deal with the situations, try to work things out, and sometimes simply make mistakes. The humor in this story kept me smiling the whole way through. There's never a dull moment as they try to deal with the rabbit. . .or the rabbit with them. And there are plenty of surprises, so don't think that a rabbit on the campground is destined to be boring or even predictable because a vacation with Tiny is all but any of these things. For those who are curious about rabbits, there is also a lot of information in here (buried in the story) on the care of bunnies as well as how they might react to things. It says a lot about a book when you want to read it's sequel. The Rabbit Ate my Flip Flops is the second in the series. The Montgomery household has now got used to the routine of having a pet house-rabbit but things start to go awry when their parents go out of town and Drew and Libby are taken on holiday with their grandparents. The plan is for Drew's friend to look after the rabbit, but Libby is worried he'll feel abandoned and sneaks him along. This story sees Drew coping with kids with a mea It says a lot about a book when you want to read it's sequel. The Rabbit Ate my Flip Flops is the second in the series. The Montgomery household has now got used to the routine of having a pet house-rabbit but things start to go awry when their parents go out of town and Drew and Libby are taken on holiday with their grandparents. The plan is for Drew's friend to look after the rabbit, but Libby is worried he'll feel abandoned and sneaks him along. This story sees Drew coping with kids with a mean dog, their grandparents over-bearing friend and a defective campervan as well as Libby finding more rabbits to rescue. It's cleverly plotted so each disaster followed nicely from the one before and events don't feel forced. I particularly liked the way the relationships between Drew and his friends, both male and female, were drawn and also the realistic way the rabbit pooped and chewed it's way through everything it shouldn't, making a refreshing change from the usual fluffy way rabbits are presented in children's fiction. Anyone considering getting a rabbit for a pet should definitely read these books. The first book was hilarious, and somehow this one is even more so! It's possibly because I knew most of the characters already, so had an instant connection with them. I felt desperately sorry for Drew because as the older brother, all the mischief that his little sister Libby causes does get linked to hime, and he tries to cover up her mistakes. You can't exactly cover up a giant bunny! Tiny the rabbit is not tiny, and causes a lot of hassle for Drew's grandparents. The disasters were both emb The first book was hilarious, and somehow this one is even more so! It's possibly because I knew most of the characters already, so had an instant connection with them. I felt desperately sorry for Drew because as the older brother, all the mischief that his little sister Libby causes does get linked to hime, and he tries to cover up her mistakes. You can't exactly cover up a giant bunny! This is the second Rabbit book we read and we love the series. Some of the things that Tiny, the Flemish Giant, does remind us so much of my sister, Butterscotch Ripple. He is a great named character in the books and the author understands bunnies. The story revolves around his adventures when his young mistress hides him away in the travel trailer where his young master and his grandparents are heading for a week at a camp ground. Tiny was supposed to stay home and his grandparents are not too happy with the turn of events but everypawdy tries to make the best of it. Poor Tiny has to stay in a small cage. Is it any wonder he manages to make a great bunny escape? The kids and grandparents have a challenging week where patience and friendships are put to the test. But it all works out for the best- even better than the best. But I don't want to spoil the fun by giving too much away. Book two in this adorable set. This time the rabbit, Tiny, ends up on vacation with the family. I found it really funny the way the grandparents interact with Tiny compared to the kids. This rabbit certainly has personality though. He seems to find himself in all kinds of mischief. Drew learned his lesson in book one and is completely honest with his grandparents. I thought it was very good for the kids to see that he learned from his mistakes and was trying not to make the same ones again. We enjoyed the first The Rabbit Ate My… book a lot and while The Rabbit Ate My Flip-Flops wasn’t quite as good, it still made a fun bedtime read aloud for my boys. The characters are quite well-developed for a children’s book. I recommend this book to pre-teen kids and to families for a read aloud. It’s not really necessary to read the first book for this one to make sense. This fun story will pull its readers in and keep them hooked until the last sentence! I highly recommend this story to almost any school-age group. Parents or grandparents would also have fun reading this story with their young ones. It would be a great bedtime novel to read nightly, chapter by chapter. I don't normally read younger books but I actually found this read to have been really enjoyable. Definitely would recommend it. In spite of the kids liking it, I loathed and dreaded every word in this book. the best part was turning the last page.